I was using 10586 before, All normal. But after I update to 14393, The top has a blank space. too ugly, because that is display on the Navigator(which display the App name). Is that a BUG or design?? Any one know? I upload the picture. 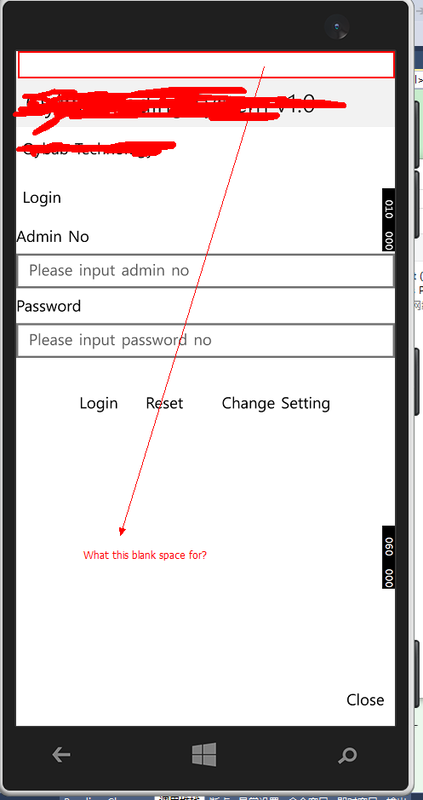 @huangjinshe - See bug https://bugzilla.xamarin.com/show_bug.cgi?id=45835 . There is a workaround in the comments that resolves this problem for me. @huangjinshe - That's interesting. I am getting the same thing (on phone, not desktop) - I assumed a change I had made had caused it but hadn't investigated yet. I guess it's not something I've done as you're getting it as well. Have you logged a bug in Bugzilla? My guess is that the change https://github.com/xamarin/Xamarin.Forms/pull/244 might have had an unintended effect. No, I haven't logged a bug in Bugzilla yet. Thank you, actually it was me. Did you use some theme on your app? looks nice, could you recommend to me? @huangjinshe - No theme used. That particular page is a ListView making use of two DataTemplates, one for sub-headings (e.g. "USER PREFERENCES") and one for each of the options (which are basically two Labels and a hidden Button, filling the ViewCell). For the ViewCells using a hidden Button, it might be possible to get rid of the Button as a result of another UWP bug being fixed.